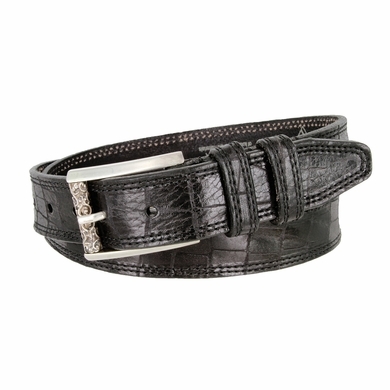 Genuine Italian Alligator Embossed Saddle Leather Casual Belt. 1-1/4" = 32mm wide Alligator Embossed Italian Saddled Leather. Simple Buckle and Double Leather Stitches for Easy Access and Maximum Comfort. Brushed Solid Brass Buckle With Floral Texture Roller. Made In Italy With Matching Double Leather Keepers.